Often parents laugh off childish and silly games. Sometimes they laugh off those games without knowing what they really are. 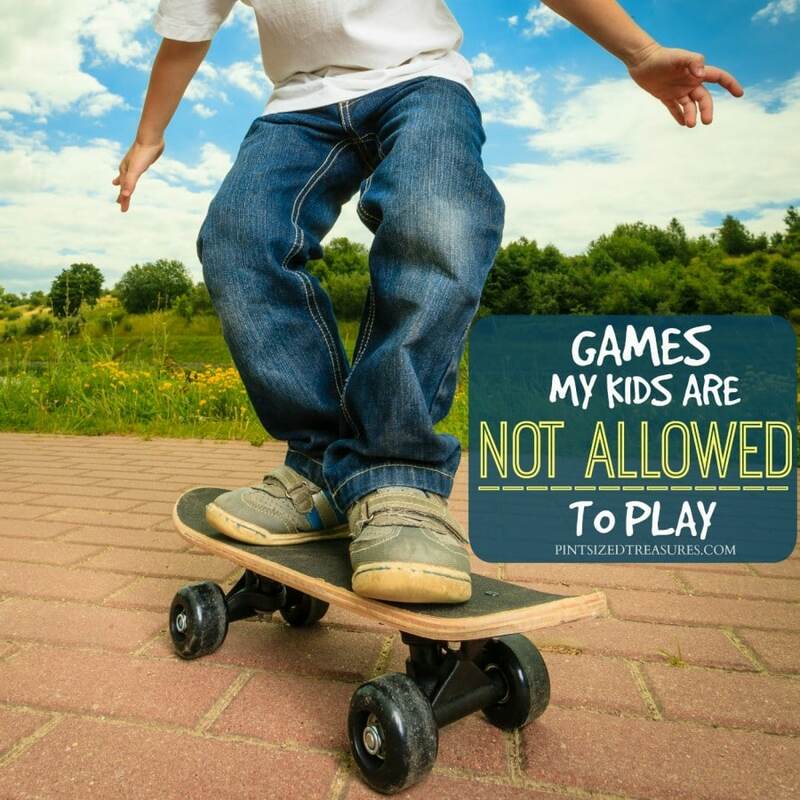 However, my kids are not allowed to play certain games — and for good reasons. I am not one of those parents that just say no to everything. Being a “yes” mom is actually one of my daily goals! I don’t like to make blanket statements like, “You can never go to sleepovers” or “You can never drink coffee” or “You can never play at her house” without considering all angles of the situation. I want my kids to fully understand that I wholly and completely want what is best for them. I want them to have a super-fun, happy childhood that is bursting with exciting memories and treasured friends. However, I do not want them to carry baggage of childish, sinful or immoral behavior throughout the rest of their lives. As a parent, I do have some control over how many regrets my kids have about their childhood. For now, my husband and I do make the final decisions in their lives — and that’s scary. It’s a huge responsibility that I don’t take lightly. It’s a responsibility that should only be faced with much prayer and guidance from the One that loves my kids even more than my husband and me. I would ask you, dear mom, to consider doing the same. If you listen to other voices instead of God’s voice, you can make some irreversible, regrettable parenting mistakes. I know we all make parenting mistakes along our journeys, but with God’s help, we can make sure they are the exception and not the norm! 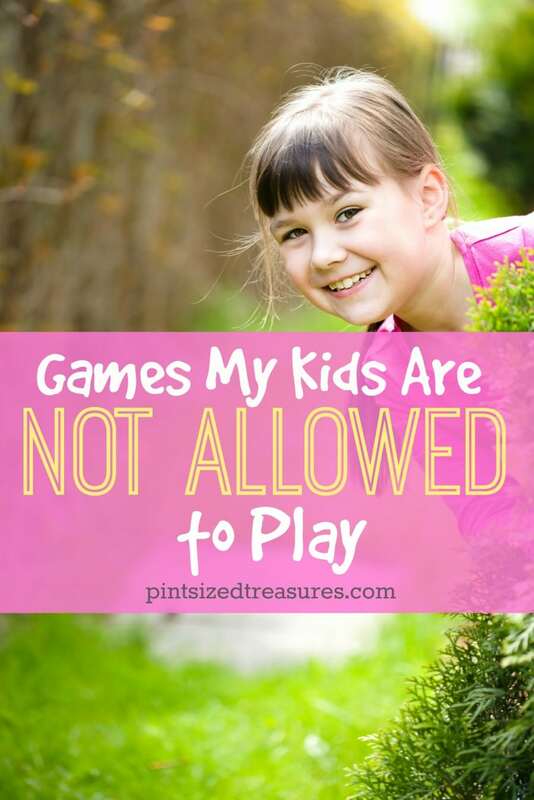 Even though the games below are popular among kids, tweens and teens today, my kids know exactly why they are not allowed to play these games — and you know what? They see our side of the story and think it’s the best decision for there safety as well. It’s awesome when you feel like you and your kids are on the same page —- isn’t it? Ding Dong Dash. Ringing someone’s doorbell at 9:30 pm at night is not the most intelligent activity in which to be engaged. Someone could mistake your child for an intruder, and things could really get scary there. So keep your kids safe, and tell them NOT to play Ding Dong Dash! But why would your kids be up, outside and alone at 9:30 pm unsupervised? That’s a whole different issue in itself! Truth or Dare. The reason I tell my kids not to play this game is because I have played it way too many times. Often it’s tweens and teens that suggest playing this game. The subjects brought up on the truth option are anything but wholesome, and the dare option leads to much trouble. Keep your kids safe and teach them to avoid Truth or Dare. Spin the bottle. There are many versions to this game. There’s a hugging version, a dancing version and a kissing version. Neither one is appropriate. Teach your kids to save their affection for their future spouse! I also want my kids to know that physical affection should be meaningful and only shown when there is truly love and care on the inside the bubbles up into a hug or a kiss — not just for a game! Cinnamon Game. To successfully complete the cinnamon challenge a person must swallow one tablespoon of powdered cinnamon in less than 60 seconds without drinking any liquids. this game can be VERY dangerous, and even deadly. The Cinnamon Challenge almost always leads to extreme coughing fits or vomiting as the cinnamon immediately dries out the mouth. In some cases the cinnamon is inhaled and causes infections in the lungs. This game is off-limits for our kids! Honey I love You, But I just Can’t Smile. Tweens and teens often giggle about how far they went with this game. The purpose of the game is to get another person to smile, so you won’t be “it” anymore. If the other person smiles, he becomes “it.” Teens and tweens have been known to act rather loosely in this game, which many times is just an excuse to be flirtatious. Teach your kids, tweens and teens to be careful — even when leaders suggest such games as this one. Ouija Board. This is a classic game that encourages kids to delve into the spirit world — a place none of them have any business going. The game tells players to be patient and not rush “the spirits.” Children should never be encouraged to ask questions, advice or direction from the “spirit world.” Those questions should be reserved for parents, God and loving teachers that are present in their lives. Choking Game. The Choking Game is a dangerous activity kids play that involves cutting off air flow to the brain to achieve a brief, euphoric high. Kids can achieve the high either by themselves through auto-asphyxiation or with help from peers. Asphyxiation is often achieved with hands around the neck or with the use of a noose-like device such as a belt. The Salt and Ice Game. Who would have thought salt and ice would be dangerous? This daring game consists of putting salt on your skin then putting ice on top of it. The combination of the two can cause extreme pain, so the goal of the challenge is to endure the pain longer then other participants. Totally not the smartest thing to do with your time! The salt and ice, if left on the skin for a certain period of time, can lead to frostbite-like blisters and scarring. Ouch! Chubby Bunny. Kids play this by placing marshmallows in their mouth and the saying “chubby bunny.” The person with the most marshmallows in their mouth wins. Kids have actually died from this game because the marshmallow melts and gets into their throat, which causes them to choke to death. Have you ever thought about kid games that can be harmful to the character, safety or health of your child? I would love to hear your thoughts on this topic! Feel free to chat with us on Facebook about this very topic!